We are so proud of Natalie for furthering her career to become a Listening and Spoken Language Specialist or LSLS. A LSLS is a speech pathologist that specialises in hearing loss and requires a lot of additional study and experience. 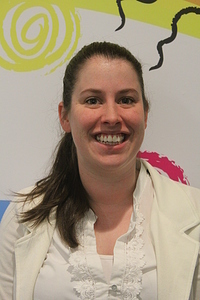 “During my studies at university I was drawn to hearing loss and this speciality area of speech pathology. I think what sparked my interest is that my uncle has a profound hearing loss in one ear. I also had a lot of middle ear infections as a child and had to get grommets and lots of hearing tests – so had some personal experience with hearing difficulties as a child,” said Natalie. Once the portfolio is approved by AG Bell, global leader in Listening and Spoken Language Certification, Natalie had to sit two 3 hour exams based on topics related to listening and spoken language development. Congratulations Natalie from The Shepherd Centre team!